Moma class SSV [Sudno Svyazyy = Communications Vessel] electronic surveillance [razvedka] ships was, and is, a costal survey ship. They are also used as buoy tenders. The converted Moma (Project 861M) is an Electronic Intelligence (ELINT) gathering ship converted from Moma class survey ship / buoy tenders. These ships carry SSV (Communications Vessel) numbers on the bow. After introduction into the fleet of the first radio and then radar systems, the primary source of information about the potential adversary was radio. To conduct a systematic exploration of these emissions in the areas of finding Navy potential enemy, the Soviet fleet created a division of scout ships: ships radio, radio and electronic intelligence. To quickly increase the number of scout ships, the hydrography ships built in the Polish shipyards were completed as a reconnaissance ships. So in the Navy of the USSR there were three average intelligence ships 850m project such as "Chariton Laptev", built in 1965 - 1966 years. The following were nine small scout ships of the base 861 and 861M project "Kildin" "Equator," "Jupiter", CER-472 "Ilmen" STS-474 "Vega", 506 "Nakhodka", a SPT 509 "Pelorus", CERs -512 "Archipelago" and CER-514 "Seliger". These ships were commissioned between 1968 and 1973. June 1, 1971 the year on the Black Sea Fleet was formed 112th Brigade ships special-purpose for the intelligence forces of a potential enemy, primarily the United States and the United naval forces of NATO , in all possible areas of its location even in peacetime. Intelligence activities were carried out with the purpose of early detection of a possible threat from a potential enemy, and developing responses. Ships in this series were built in Gdansk, Poland. According to NATO classification - Moma Class. Total for this project during the 1967-73 biennium. 29 vessels have been built. Some of them (9 units) has been transformed into a scout ship under pr.861M, three more units were also converted to BRD (without the project). The special equipment data ships were: on radar - "Don 'on underwater acoustics -" Bronze ", etc., by radio intelligence apparatus -" Rotor-H "," M-Watch, "" Watch-10 "," Vahta-. 12, "MPP-1-7," Coil-AK "," Reticle-M "," assembly "," Kira "et al. Vessels of this project were initially not carrying arms. The hull of the reconnaissance ship was made of conventional welded shipbuilding steel, and had a double bottom. The construction has ice strengthening, which allows to go on broken ice. Nine watertight bulkheads provide protection against flooding of any two adjacent compartments. The ship has bunk superstructure made of AMG-alloy for facilitating design and is located in the middle part of the hull. In the aft part of the superstructure located a streamlined chimney, and before it the mainmast with radio antennas intelligence. The first tier superstructure was extended when upgrading, and a roof-mounted jib mast with antennas ELINT was added. In the aft part of the ship davits were arranged with two working cutters. When the ship has a large modernization the roof superstructures on the first tier had radiotransparent cap fiberglass to protect equipment from rain and sea water. 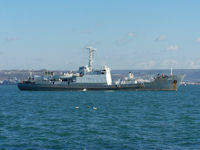 The former hydrographic survey vessel "Liman" (No.861/19), converted into the Intelligence Ship in 1989. A Russian naval intelligence ship sank 27 April 2017 after a collision with a freighter tore a hole in its hull in the Black Sea off Istanbul. The ship was heading for the Syrian coast for a combat mission. It will now be replaced by one of the seven equivalent-class ships from the Black Sea Fleet. During its service it had conducted more than ten expeditions in the Atlantic and Indian Oceans and was also regularly active in the international waters of the Mediterranean Sea and Black Sea. All 78 sailors aboard the spy ship Liman were safe following the April 27 collision, which occurred about 40 kilometers northwest of the Bosphorus Strait. The crew of the cargo ship was also safe, while 15 Russian sailors had been rescued from the sea after the collision, and the others evacuated from the ship. The Russian Defense Ministry confirmed that no crew members were killed. How the vessel still managed to hit the freighter, is not known. But it should have been fog and poor visibility in the area when the accident occurred. On board the freighter were 8,000 sheep on the way from Romania to Jordan. The ship sustained damage to the bow, but could continue sailing after the incident. Liman (from the Greek for harbor or bay ) is a shallow bay at the confluence of the river to the sea. Liman is formed at flooding sea flat rivers and can be open or separated from the sea by a narrow strip of land. Typically, water in the firth has intermediate salinity between sea water and fresh water rivers, but at low inflow of fresh water it can greatly salinization due to evaporation. There was heavy fog at the time of the accident. However, experts believe this doesn’t justify the sailor's actions. "During fog, when a ship enters the Strait is must have a reinforced watch. Sailors with machine guns must stand on deck protecting the vessel from saboteurs and the captain must be sitting in the wheelhouse, personally following the geo-locators, which show the surrounding vessels," said third-rank reserve captain and military analyst from the Izvestia daily Dmitry Litovkin. In his words, fog does not influence the devices and if the investigation confirms The Liman captain's was at fault, he may be looking down the barrel of a jail sentence. Also, during the investigation the second vessel will be secured and anchored at a Turkish port. "Its logs, monograms, and readings will be taken away. Since this ship belongs to a different state, an international court will take on the case, while Russia will demand compensation for The Liman," explained former Supreme Commander of the Black Sea Fleet and First Deputy Naval Supreme Commander Retired Admiral Igor Kasatonov. Secret Russian equipment was located on the deck and in the first hour after the incident it could have been taken by Turkish divers. The ship was equipped with the Don radar system, the Bronza hydro-acoustic system, and a series of radio reconnaissance devices. It did not have any large missile systems, only the Igla portable air defense system.